With two cases of sedition, one police complaint filed against him already in three Indian states and mobs picketing in front of his house in fourth, Aamir Khan must be a worried man. He must be for the first of these cases is listed for hearing on 1 December in Kanpur, far away from his house in Mumbai. It is just that Aamir Khan has not engaged in any criminal activity. He cannot as well, most likely, as he is not an ordinary citizen of India but a film superstar with a fan following that runs in millions and thereby subjects him to twenty four hour media scrutiny; if one does not want to call it paparazzi, what electronic media in India is with hardly any exception. 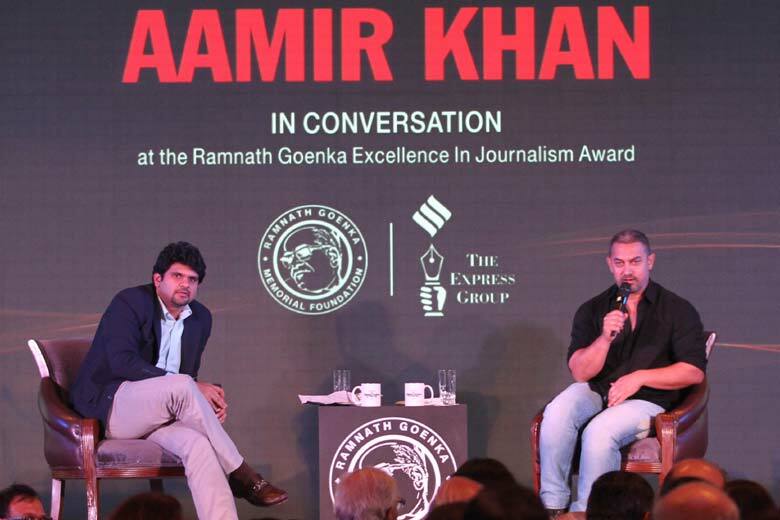 All Mr. Khan had done to invite the wrath of so many people across the country was making a statement in a freewheeling conversation during the Ramnath Goenka Awards ceremony, the most prestigious media awards in India for the uninitiated. Mr. Khan might not have realized it then, but he seemed to be hell bent on inviting the wrath of the ever so tolerant and patriotic mob on him. Who talks of the times that are not particularly good for journalism when even the media does not, after all? Who then adds fuel to the self righteous anger of the mobs by supporting the right of scores of writers who returned their awards in protest against growing intolerance and fanatical violence in India? Mr. Khan and his wife are perfectly right in being worried, any conscientious citizen of India would be in the aftermath of killings of writers, death threats to others, mob lynchings over rumours of eating beef and what not. Mr Khan must have learnt his lessons from scores of writers, artists and others who had crossed the path of the new government. Seems he had none. He talked about what is on everyone’s mind and is being hounded the same way countless others have been after the new regime took over. There have been both- a lot of debate on increasing intolerance and active resistance to the same and every conscientious citizen of India can only be on the side of the resistance. The hounding must worry not only him but all those who believe in the idea of India being a republic based on justice and rule of law. The hounding, however, should not be the only thing to worry us. The attacks on Aamir Khan were expected, more so from openly fanatical mobs prodded by their political handlers to hound dissenters. What should be worrying us more are the sedition cases and the police complaints slapped on him across India. It should worry us more as our judiciary is not a militant organ of a politico religious ideology- it cannot and must not support mobs hounding a person, any person, for expressing his views. It should worry us more because the judiciary has let itself been abused by politically motivated groups to hound people time and again despite the Supreme Court of India being very clear on that. In a judgement passed on 3 February 2011, in Arup Bhuyan v. State of Assam case (Cr.A.No.889/2007) the Court had held that ‘mere membership of a banned organization will not make a person a criminal unless he resorts to violence or incites people to violence or creates public disorder by violence or incitement to violence’. The court had held the same later while granting bail to Dr. Binayak Sen. Confront the order with the sedition charges slapped on Mr. Khan for making a statement that far from inciting any violence merely voiced his concerns over incidents of growing violence and the irony would not be lost on many. Add to that the fact that not even ordinary criminal charges were filed against the members of the mob that attacked his house in Mumbai, the ministers who gleamed over the fact that Dadri lynch mob did not ‘even touch 17 years old daughter of the victim, the Members of Parliament that routinely threaten marginalised communities and so on and the delinquency of the judiciary would seem unacceptable. That, unfortunately, is not the end of the story. There is no dearth of studies that establish how difficult it is for ordinary citizens of India to get their genuine grievances registered in police stations. There are ample research that shows how police in India brings down crime rates not by bringing down it really but not registering complaints. Add to this the dismal status of case disposal in judiciary with the Ministry of Law informing the parliament that 26,851,766 cases were pending in subordinate courts in March 2012 and the pictures become gloomier. Can anything be more criminal, then, than accepting frivolous charges to hound a person and deny him/her freedom of speech when countless Indians wait for justice? Aamir Khan’s hounding has brought the delinquency engrained in the justice system of India back to the fore. The only way to bring justice to people, and also to bring fanatic, criminal people to justice is have a judiciary that works for rule of law and not abusing it by hounding innocents.